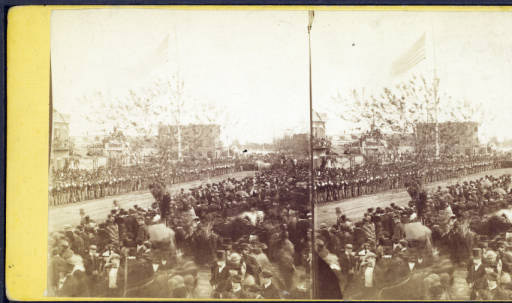 A photograph taken by Ridgway Glover of soldiers that depicts a crowd of soldiers and civilians waiting for the arrival of Lincoln’s funeral train into Philadelphia, Pennsylvania. The soldiers gathered, part of the 9th Union League were also members of the 125th Pennsylvania Infantry regiment. Lincoln’s body arrived in Philadelphia on April 22 and remained there until April 23 before it traveled to New York City. Use of this item for research, teaching and private study is permitted with proper citation and attribution. Reproduction of this item for publication, broadcast or commercial use requires written permission. For permission, please contact Huntington Digital Library, San Marino, Ca.